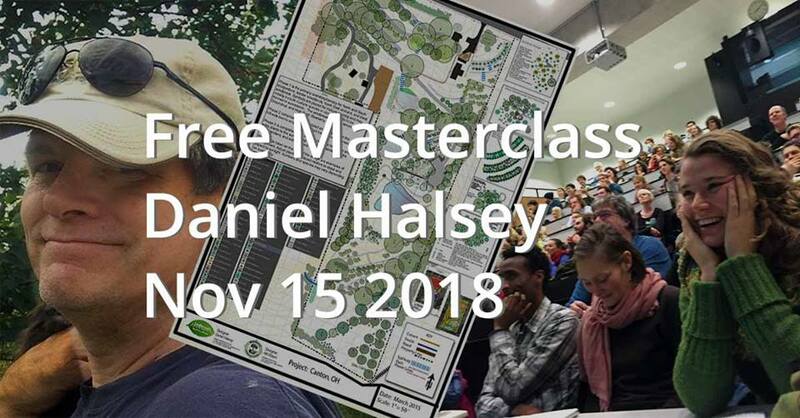 This Thursday evening (15th November) Daniel Halsey, an internationally renowned designer of ecosystem restoring landscapes, both large and small, will hold a lecture/masterclass open to students and others interested. In current times with increasing need for changing landscape models and ways to cope with climate change, using ecosystem design could be one of the key answers! This master class is interesting for anyone who is involved in developing landscapes, ecosystem restoration, and new forms of agriculture, peasantry, forestry and food supply. It will be open to students and others interested and takes place on November 15th in the Forum Building, C222. No registration and no entrance fee. Just show up on time. After an introduction by John D. Liu, the maker of Green Gold, Daniel Halsey will show you how he works and how important design is for designing the foodscapes of the future. In his work he builds around the natural characteristics of the area and starts his design from there. In the second part, three cases will be presented to which Daniel Halsey will respond. This part will be open for questions and interaction. The first case derives from the Ecosystem Restoration Camp in Spain wherein both John D. Lui and Daniel have played a crucial role in initiating and making the design for the camp. The second case looks at a particular Dutch site of cultural heritage where the ecosystem is currently out of balance. With ‘renewing’ the management practices by using sheep and co-operation models it is aimed to reach a sustainable landscape. The third case is brought in by a student from Wageningen University. He will present his future plan for a farm in Colorado (US) and raise questions concerning the determination of the farm size while maintaining ecosystem services of nature reserve. And concerning the management tactics that can be used to show society the value of their efforts for the community. This event is organized by course organizer The Plant, in collaboration with Weruschca Kirkegaard Stichting Boerengroep (Farmers Foundation) and the Farming Systems Ecology, Wageningen UR and will take place in the Forum building C222 on the WUR campus. You are welcome from 19:30 for coffee and tea. The master-class starts at 20h and is free of charge.